What is Ethical Hand Mining of Crystals All About? What is Ethical Hand Mining? I recently spoke with Stephen Wells, the owner of Kacha Stones about the importance of ethical hand mining. In terms of crystal mining, ethical means dealing with smaller scale miners that aren’t causing wholesale destruction. An example of this kind of destruction would be dynamiting methods used in Brazil for example, where a hillside is destroyed and the rubble sorted and sold for everything from jewellery to road fill. I mine myself here in Wales and travel to India twice a year to collect my Himalayan and Tibetan quartz from people I have known for nearly twenty years. My other main item is Brandberg quartz where I deal directly with individual miners through another long term contact. What these four locations have in common, is that the mining is done by hand and holes refilled. The only way you can have any control over this trade is by buying directly from the people digging, which is what I do wherever possible. As these people work for themselves, the chances are they aren’t treating themselves unethically so other exploitation of labour issues – almost exclusively related to the mining of precious stones – don’t really come into play. If you want to read more about Stephen's journey check out this delightful interview I did with him a few years back. Omapeleki Brandberg Quartz ~ NEW ARRIVALS! Here's another beautiful Omapeleki. This picture (below) shows the refined internal layers of a skeletal face. Bottom right of the shaft contains a negative manifestation enhydro ~ a perfect DT crystal water pocket. This "inside-out" nature of the formation is why the photographic term "negative" was used. Water Crystals Another interesting feature of the Negative Manifestation formation is that the internal "crystals" (crystal shaped hollows full of water) always have angles parallel to the parent crystal, indicating their resonance with the whole. The water they contain is easily programmed, acting like a re-writable liquid hard disc. More Negative Manifestation Enhydros can be seen on this page. 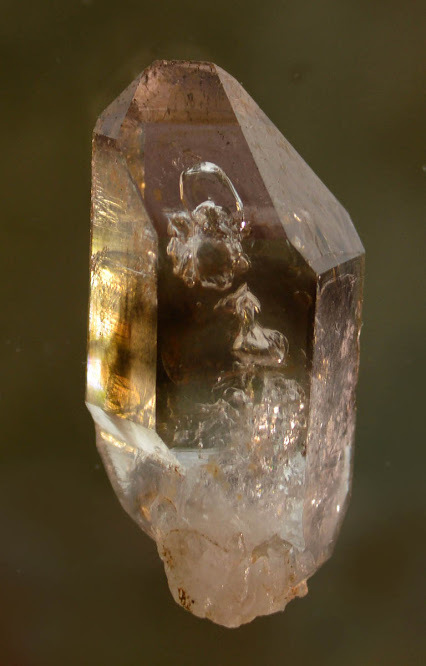 Good for Scrying ~ Enhydro Quartz Smoky Flame Brandberg Crystal We have seen a lot of the rare negative manifestation enhydros, but in the vast majority of cases, the water pockets are irregular and curved like in the picture (see below). The thinness of this hollow causes the bubble to sit at the bottom. One of the reasons crystals are used for scrying is that quartz naturally lends itself as a blackboard for our subconscious to scribble on. This smoky flame Brandberg is a good example. Stonehenge Inner Circle ~ Preseli BluestonePreseli Bluestone is famous for its use in the original inner rings of Stonehenge. Approximately 80 of these bluestone columns, each one harder than granite and weighing about four tons, were transported over 240 miles (385 km) to Salisbury Plain. They originated, as do these, in the Preseli Hills of West Wales. Kacha Stones is within view of these ancient hills, giving us a special connection with this magical stone. Bluestone was taken over 240 miles for a reason. There is archaeological evidence that small pieces were given to pilgrims visiting Stonehenge over 4000 years ago by the priests. Ancient Welsh folklore also attributes magical and healing powers to this unique stone. Geoffrey of Monmouth, The History of the Kings of Britain, 12th centuryIn Monmouth's story, when planning Stonehenge Merlin suggests to Aurelius that he ought to send an expedition to the far West of Britain to fetch the stones. The King begins to laugh and asks: "How can such large stones be moved from so far-distant a country?" he asked. "It is hardly as if Britain itself is lacking in stones big enough for the job!" "Try not to laugh in a foolish way, your Majesty," answered Merlin. "What I am suggesting has nothing ludicrous about it. These stones are connected with certain secret religious rites and they have various properties which are medicinally important. Their [giants] plan was that, whenever they felt ill, baths should be prepared at the foot of the stones; for they used to pour water over them and to run this water into baths in which their sick were cured. What is more, they mixed the water with herbal concoctions and so healed their wounds. There is not a single stone among them which hasn't some medicinal value." Ethically mined healing crystals and jewellery. We specialize in rare crystals including Brandbergs, Himalayan and Tibetan. Online for over 15 years. Worldwide Shipping. *Use KATHY as the discount code at checkout to receive a 10% discount! Kathy Crabbe has been an artist forever and a soul reader since awakening her intuitive gifts at age forty after five years painting with her non-dominant left hand. This awoke her intuition in a big way. In 2008 she created a Lefty Oracle deck and started giving intuitive soul readings that have touched many lives in profound and playful ways. Kathy lives in sunny Southern California with her pet muses and architect husband in an adobe home they built themselves. Lately I've been spending more time with my crystals in meditation. I hold them up to my third eye using my non-dominant and more intuitive left hand as I attempt to 'speak with stones'. Some of the messages I received are included below. I hope that these images of my spring altar and stones inspire you to pick up your own crystals and spend more time with them. Not everyone can 'hear' the stones speak but with practice you may start to get an intuitive sense or feeling from them. More information is included below including my favorite crystal resources. 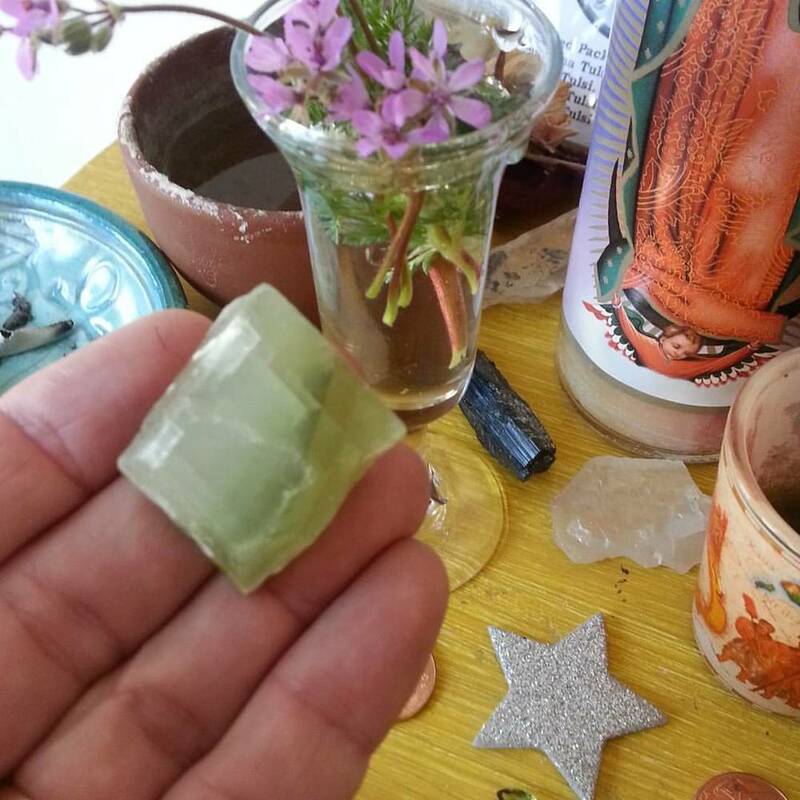 Meditating with green calcite this morning brought clarity and peace and a vision of the bigger picture connected with my heart chakra opening me to possibilities that flow with ease and beauty. As I work with the stones I focus focus focus honing in on deep inner truth and then I pull a Lefty Oracle card and it brings me back to the playful spirit that is me in the world. 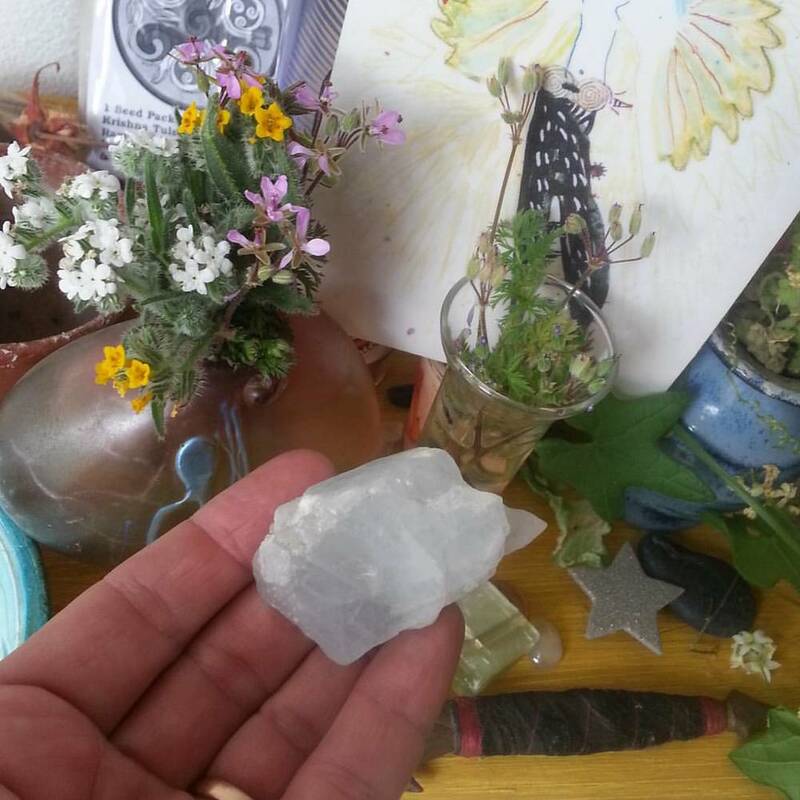 Feelings of great peace surrounded by Angelic presences blessing and healing our planet and ourselves… Blessings of Celestite. My desk is abloom in Spring as I soak up the Equinox ritual call with my mentor Francesca De Grandis and others of like mind Blessed Be 4 spring is here and the wild cucumbers are flowering & covering my coyote friends who were crushed by human hands. Here is a recent spread from a soul reading that I did last week using my Lefty Oracle deck. How to work with stones and crystals: The best way to work with a stone is to buy a raw or tumbled stone at a local new age store, gem and mineral museum shop or online. You can also work from a photograph or with the color associated with the stone by visualizing it in your mind's eye. You can wear stones as jewelry, or you can carry one in your pocket. You can sleep with a stone under your pillow or hold it in your hand and just sit quietly in a contemplative or meditative way. You can also hold a stone up to your third eye (between your eyebrows) and listen for what it has to say to you. I call this ‘speaking with stones’ because I believe that crystals are transmit messages from our Angels. Dear Creative Souls, It's the New Moon in Scorpio PLUS a solar eclipse this Thursday, October 23rd and time again for a Creative Soul Challenge and Creative Soul Card from my very own deck. It's also time to set your intentions for the month ahead. I will also be sharing a Creative Soul Body Challenge in my Facebook group, the Creative Soul Circle where membership is free. If you like what you see in this article then you will love my Creative Soul Class which will be starting in Nov/Dec, 2014 in Riverside County, California in several locations to be announced soon and also online at the Wise Woman University in 2015. Affirmation: I adventure within on a journey of soul. We are going deep within for healing at this new moon to visit the small, scared child within as we go back to a time when tears were held in or released. Until our small, naked self appears and we cry out our own name. We reach for our child self and we hug her or him close allowing the warmth of our touch and our hearts to melt...to melt...to melt our fears and to release their grip on us, washing everything clean. We allow our child self to reside in us where she/he will be safe and protected forever. Who did this to you? Who caused you grief and trauma and hurt as a child? And can you go back in history to see this pattern repeating itself through the generations? and perfect just as I am. If you like what you see here please consider taking my upcoming Creative Soul Class which will meet online and in-person at the New and Full Moon. Purchase my Goddess Zodiac ebook here. Purchase Creative Soul Cards and Prints here. ABOUT KATHY I am a Canadian born, self taught intuitive artist, writer, teacher and creative soul guide currently living and working in a desert valley of Southern California surrounded by ancient oaks and an elfin forest. We live on 5 acres in a home created by my husband that we share with our dog and cat muses, Abby and Spartacus. I’ve been drawing since age two and offering creative soul guidance since 2008. I teach a class called Awaken Your Creative Soul which is accompanied by my Creative Soul Deck. It's the New Moon in Libra on September 23 at 11:14 pm Pacific time. Libra is ruled by the planet Venus, the Goddess of Love so it's time to take a good, hard look at all your relationships, including the one you have with yourself. As usual, I have pulled a Creative Soul Card from my own handpainted 'lefty' deck and written/channeled a New Moon Challenge to go along with it along with a song for Libra's Healing Gemstone, the Bloodstone. I was also inspired by the beautiful setting (see photo to your left) where I held this New Moon Circle; a place where the Green Goddess is very happy, content and thriving. If you are inspired by this material then you may be interested in attending my upcoming Creative Soul Classes which will meet online and in-person at the New and Full Moon. Listen Listen Listen to the wind. Become the wind. You ARE the wind. Does it chill you? Warm you? Relax you? Frighten you? Take note. Relax your bones, letting the wind carry you until you are everywhere all at once - at one with the wind. This is the energy of the Libra New Moon. I am first I am glorious I am healed I am Bloodstone flowing and in tune with Mama Moon. I cherish I hold I love fierce and true and proud. O New Moon, take me break me make me whole as I sing your song and I bloom I bloom I bloom. O Bloodroot, take me down to the depths where each seed I plant is true. Affirmation: I stand up for me, not neg-a-tiv-ity. This card challenges you to seek and find where you're out of balance. To gather with those of like-mind and to let go of negative energy and negative people who feed on your energy and who bring you down. Help them, yes, but don't let them feed on you energetically. Take notice of how you feel after being with them and distance yourself when necessary. This card accepts and takes from you all that negativity, so let it roll right out of you and into that black ball within the "Liar at the Crossroads". Your choice. At this New Moon, along with setting your intentions for the moonth ahead, I challenge you to let go of one negative person, thing, feeling, energy, vibe - whatever it is. Make sure to get some support along the way, either from your Moon Group, in the Creative Soul Circle (my free Facebook Group) or from close friends or a counselor. ABOUT KATHY CRABBE I am a Canadian born, self taught intuitive artist and creative soul guide currently living in a desert valley of Southern California surrounded by ancient oaks and an elfin forest. I live in a home created by my husband that we share with our cat and dog muses, Spartacus and Abby. I’ve been drawing since age two and offering creative soul guidance since 2008.